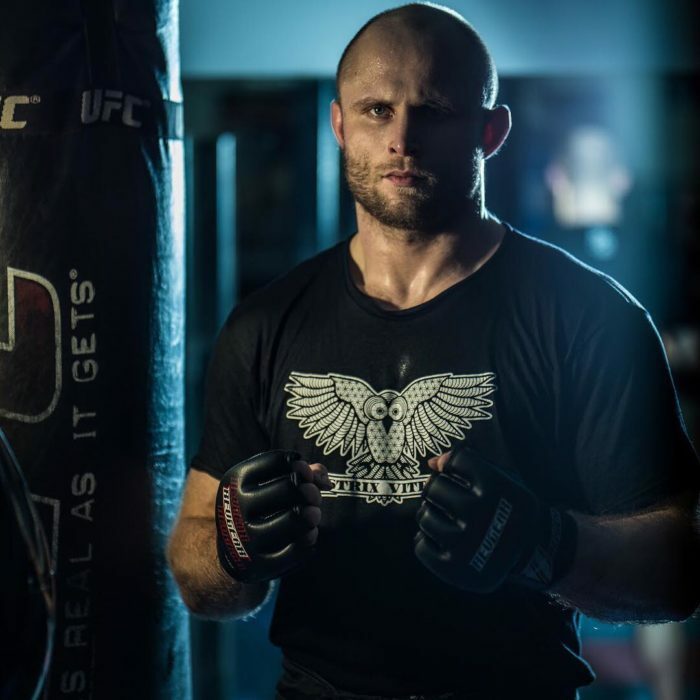 Clive, Iowa – America’s heartland played host to LFA 60, a finish-packed show that saw Julius Anglickas crowned the new LFA Light Heavyweight Champion in the main event. Read on for recaps & clips from that title clash, plus four finishes in five LFA 60 undercard fights, broadcast live on AXS TV. 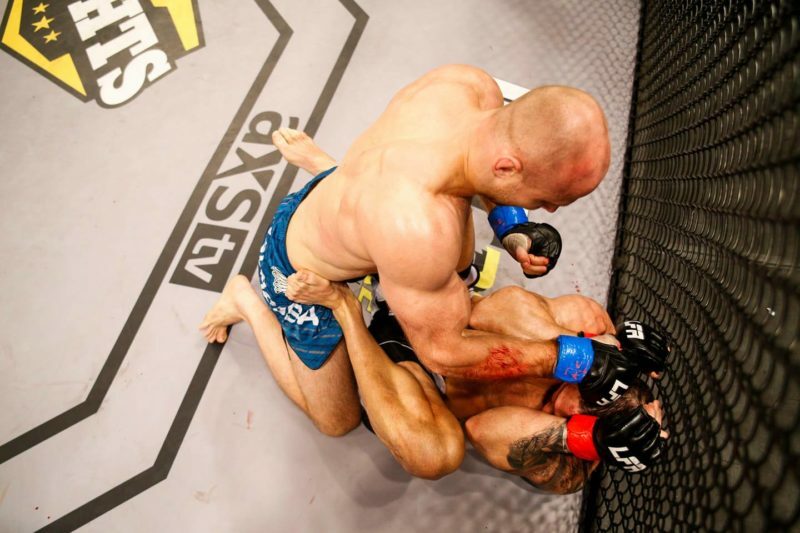 The LFA 60 main event was billed as a striker versus wrestler clash, but Missouri Golden Gloves winner Julius Anglickas (6-1, #192 World) flipped the script and showed off his grappling skills en route to claiming the vacant LFA Light Heavyweight Championship. Largely untested Oregon wrestler Clayton York (5-1) enjoyed some early success, taking Anglickas down to the mat and holding top control for the first few minutes. Unfortunately for York, 28, his gas tank flagged quickly as he struggled to control the much larger Anglickas. With two minutes to go in round 1, Anglickas shifted the tides by sweeping to top position, which he held for the last two minutes of the frame. The boxer’s wrestling chops shined through in round 2 as he scored the takedown and proceeded to dominate with pressure and heavy ground strikes from guard. When a desperate York tried to scramble to his feet with a minute left, Anglickas snatched back mount and squeezed out an RNC with 47 seconds left in the second round. Beautiful work from Julius Anglickas, who took home one of regional MMA’s most prestigious belts while proving that he’s no one-dimensional fighter. Anglickas, 27, became the second LFA Light Heavyweight Champion in the company’s history. Will it be long before the Lithuanian-born martial artist joins inaugural LFA Light Heavyweight Champion Ryan Spann in the big show? Both of these midwestern scrappers were content to stand and trade technical strikes in the opening minutes. That seemed to favor Missouri’s Trey Ogden (12-3, #288 World), who landed several punches while Iowa’s Anthony Baccam (12-7, #432 World) fired back with leg kicks. After doing some good work on the feet, Ogden secured round 1 with a takedown and 90 seconds of top control. Ogden must have liked what he felt on the ground in round 1. The Glory MMA rep immediately took Baccam to the ground and started grinding away with positional dominance. “The Bengal” was certainly game as he constantly struggled and finally swept to the top position with 90 seconds to go. Baccam didn’t have much more luck dealing damage as both men appeared to be in good fighting shape headed to the final round. Round 3 was rinse-and-repeat for Ogden, who scored a quick takedown and managed to avoid losing top position for the entire frame. 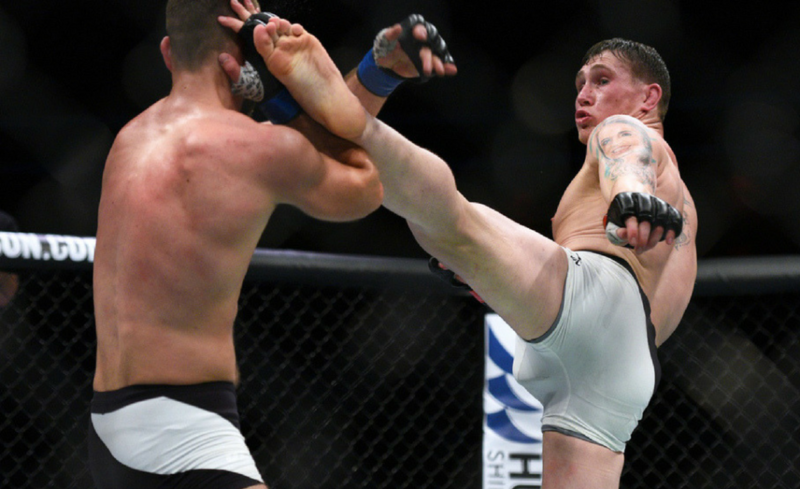 Ogden briefly advanced to mount and threatened an arm triangle but never neared a finish. It wasn’t the most exciting performance by Trey Ogden, but this was a comprehensive win that advanced the 29-year-old lightweight to 3-0 inside the LFA cage and positioned him for a potential future title shot. Sometimes your surefire fight of the night just doesn’t materialize. 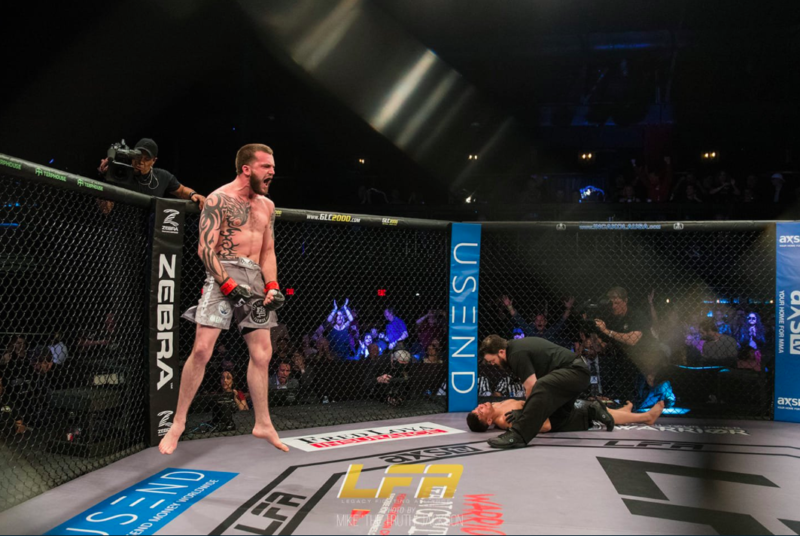 Carl Wittstock (10-5) earned his “Crazy” nickname via willingness to throw down in reckless brawls, like his bloody war with Brandon Jenkins at LFA 29. Wittstock tossed Luis Saldana (13-6, #182 World) a curveball by immediately shooting for a takedown. Saldana reacted nicely, sprawling and expertly scrambling around to back mount. When Wittstock reached for a leglock, Saldana used that opportunity to advance to mount until the round 1 bell. Des Moines native Saldana entered round 2 with a clear 10-9 edge, though he didn’t enact much damage from a dominant position. After exchanging a few blows, Wittstock barreled forward for a wild takedown. Once again Saldana was up to the task, reversing position and dominating the entire round with grappling. This time, Saldana did some serious damage with elbows before sinking in an RNC in the final minute. 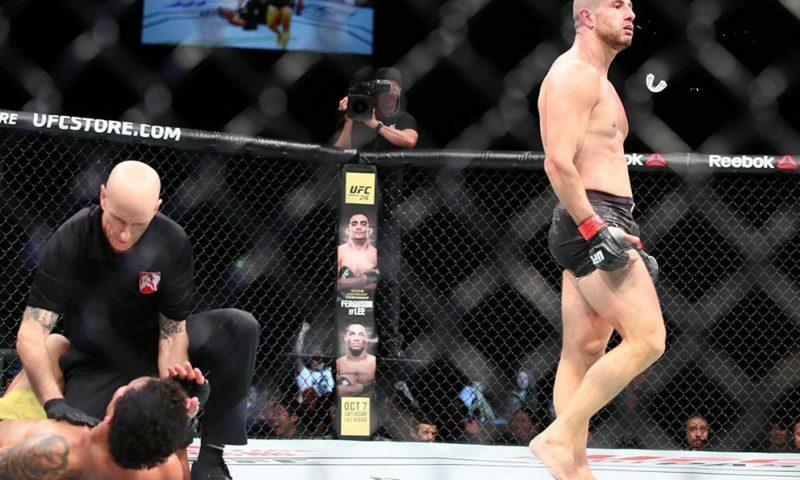 Wittstock chose to nap rather than tap as he absorbed his first career submission loss. 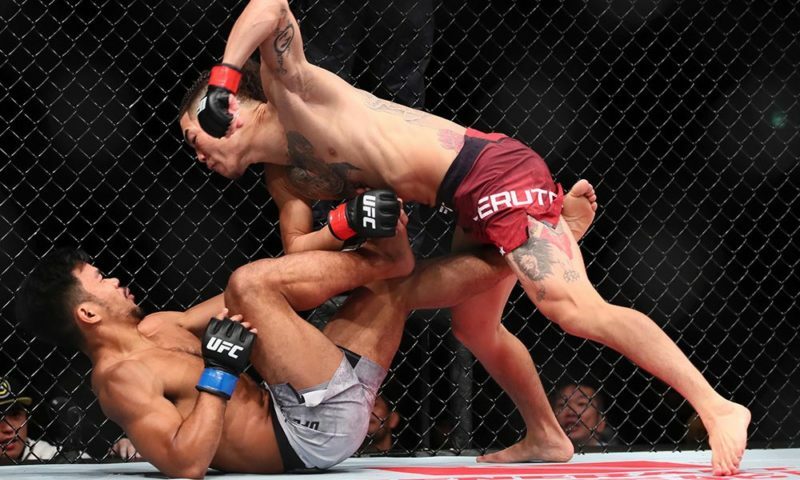 It wasn’t the war that some envisioned but solid work nonetheless from Saldana, who built off of a win over UFC vet Junior Hernandez his last time out. No feeling out process here as Darrius Flowers (7-3-1, #388 World) stepped forward flinging heat while Jonathan Thomson (9-5, #433 World) tried to slow him with kicks and counters. That approach proved fruitless as “Beast Mode” sent Thomson to dreamworld 48 seconds in with a spectacular pair of knees to the face! Flowers spent his post-fight mic time equally well, proclaiming himself the best welterweight in the midwest and calling for an LFA title shot. Another quick one here as Missouri state wrestling champ Dakota Bush (6-1, #538 World) found himself in early trouble but rallied for a round 1 submission. Iowa’s Jordan Hinman (7-5, #379 World) scored with a German suplex in the opening minute and briefly ensnared the back. But Bush freed himself and used a wrestling switch to gain position and work toward back mount. When Hinman tried to roll through, Bush locked in an RNC that put Hinman out cold for around seven or eight seconds before the regional ref realized that he was unconscious. Ugly refereeing aside, this was a spirited scrap from both lightweights and a nice win for the promising 24-year-old Bush. As soon as the opening bell tolled, Iowa local Patrick Martin (7-4) smashed Byron Stevens (2-1) with a thunderous, wide right hook. Moments later, the 6’6″ Martin overwhelmed his fallen foe with a volley of GNP. Flawless work from Martin, 35, who has finished six of his last seven foes after a slow start to his late-blooming pro career. Love World MMA? So do we!